Thought Experiment - Retirement DwellingsEliminate The Muda! Some of us run comprehensive calculators to determine how much we need to afford the retirement of our dreams. Others live life with faith alone that we will arrive in retirement properly prepared. Yet neither approach guarantees success. None of us can predict all the events that will build our ultimate retirement. How many were prepared for the Market Meltdown of 2007? Thousands of baby boomers had to alter their retirement plans unexpectedly. Sadly, many of these no longer see retirement as even being an option. According to AARP, for example, the average baby boomer holds two-thirds of their net worth in their homes. When real estate prices collapsed, their dreams of retirement did as well. Million continue to face foreclosure or have already lost their homes. What many boomers perceived as the very lifeboat of their retirement became the anchor that dragged them back towards poverty. How can you prevent this from happening to yourself? Diversification is the only protection. As long as your home represents the majority of your wealth, you risk catastrophic loss due to real estate market fluctuations. Conceivably, guaranteed protection would only be possible if your home represented a small portion of your overall net worth. Today’s thought experiment, how frugal of a home could you retire in? So what are the options? Living off the land -This is not for the squeamish or the lazy. It is the ultimate in frugal living and convenience-tax free, but it does come with a price, labor. This approach will require a completely different skill-set. If you are serious, check out this homeless survival guide for some good tips. 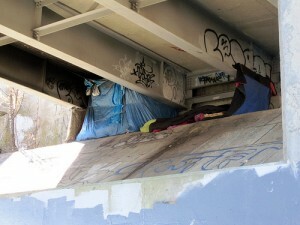 Being homeless you can live in or under public buildings and structures. Some of proven resourceful enough to find shelter in drainage pipes, tunnels, and caves. Portable Living – Portable living gives you several low cost options to lodging. My personal preference would be a decent strong-hulled sailboat. Boats can be more frugal than you think. 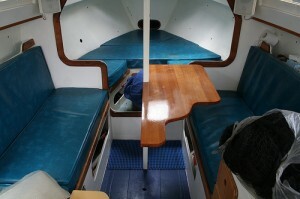 While the boat itself requires continued maintenance, it is hard to spend money when you are not on-shore! If the water is not for you, there are some great deals on used recreational vehicles from small pop-ups to the giant diesel pushers. Land or water, the price of these housing options can be extremely frugal or get out of control very quickly; tread lightly and be well-educated before committing. Minimalist Construction – Minimalist homes come in all shapes, sizes and of a range of materials. Even old shipping containers are being turned into houses. Some amazing dwellings have been built in trees or on trailers. If you can find enjoyment in cramped quarters or spend the majority of your day outside this may be an ideal low-cost option. Renewable Construction – If alternative living situations and the minimalist approach are not up your alley, there are frugal options to building your dream-home. While many look down on the idea of a home constructed of rammed-earth or adobe, the reality is these kinds of construction methods have housed our ancestors for thousands of years. In fact, earthen homes have proven their ability to outlast conventional stick-built homes. Log cabins when properly constructed have also passed the test of time as have sod, bamboo and straw-bale construction. Just make sure your material of choice is suited to the environment in which you build. Some of these materials can be obtained for little or no cost. With sweat equity, some of these homes could be built for price of utilities, appliances and fixtures. Reuse Construction – As cheap as homes are in Detroit (Another Thought Experiment), it is conceivable that the right purchase could be disassembled and all material reused in a location of your choice. OK, so this idea is a little extreme, but homes have been built from old wine bottles, tires, and yes, even from torn-down homes. The key here is free materials, the more you don’t spend on materials, the more you have to fund your retirement. Existing Construction- Like Detroit, there are locations around the globe that have very low cost housing options. In the past I have considered Caribbean or Central American locations while some Eliminate the Muda readers have recommended Bali. For some of us, leaving the U.S. is out of the question. Just because it cost hundreds of thousands to build an existing structure does not mean that you must pay full price. On the other hand, you could spend all the money (someone else’s!). If you could find the right multi-family housing unit, rents could cover your living expense. You may also enjoy the benefit of a positive cash flow to supplement your retirement income. In the end, low or no cost house leaves you with more liquid assets to invest or finance your retirement living. Readers: How about you; are you taking one of these approaches to frugal living or do you have another idea? If not, when you do need the money there will always be the reverse mortgage option! .-= Money Smarts´s last blog ..If Your House Is Worth Less Than You Owe, Is It OK To Just Stop Paying Your Mortgage And Walk Away? =-. Thanks for the back link! I love reading and researching alternative housing possibilities, probably because I’m still trying to figure out my own housing situation; do I want to be a traditional home owner, or something more adventurous, like a Tumbleweed home owner. Decisions, decisions…..
.-= Little House´s last blog ..Livable Living Expenses =-. Way to go and question our “conventional” thoughts on retirement. There’s no hard and fast rule about how you have to live. It seems like the driving factor is change. Many older people I know simply don’t want to move because they have a routine or are used to the way their live unfolds each day. .-= FinEngr´s last blog ..Don’t Be Fooled by Sneaky Labeling! =-. Nice alternatives, the Minimalist homes are interesting, but it would feel a bit like living in a coffin IMHO… If I didn’t have kids nor enough money to afford a normal house, I’d still consider it! .-= Money Reasons´s last blog ..How I Got A Deck Table And Chairs For 25 Percent of The Cost =-. .-= Roshawn @ Watson Inc´s last blog ..Yakezie Round Up & Uncommon Money News (Vol. 94) =-. Interesting. I wouldn’t mind living in a very small space–as long as my husband would agree not to have too much stuff ;). I’ve seen some mobile homes and pre-fab type homes that are quite live able and I’m all for rethinking ‘needs’ in order to make saving for retirement more doable. Really, I’ve seen too many arguments saying you have to have a 10% return or else you can’t retire. I think that’s what’s driven people to take on so much risk–yes, it’s a gamble, but many folks I know seem to think it’s the only way–I think that’s strongly linked to our assumptions about how much we need to be happy. I could very easily live in a ‘tiny home’, the husband, not so much…he likes his space. We currently live in a 2800s/f tri level which we use about 1/4 of and we also have a small one-bedroom cabin on a lake in the woods… the cabin is 1/3 the size of our ‘home’ but when we are there i am in complete heaven (and not just because of the surroundings, though they are very, very helpful mind you)..it’s just the fact that we utilize the entire space while we are there, there is no waste. To me that is the perfect scenerio of how we SHOULD be living. McMansions to me are ridiculous. So we see ourselves moving to a ‘smaller’ place and spending months at a time overseas traveling and months back in the US in a low-maintenance easy to keep dwelling. And that could very easily include just going back to apartment living. I like the nugget you put in about diversification. Very true, I know folks that have lost quite a sizeable percentage of net worth in the recent housing decline. I’m glad to have avoided this fate, but very well could have if I made different decisions. Fate is an interesting thing! Yes, Detroit does have some incredibly low-cost housing. I don’t live there, but am fascinated with the opportunities that exist there in real estate. Not sure if they are a mirage though. .-= Squirrelers´s last blog ..Months of Covered Expenses: An Alternate Measure of Wealth =-. @MoneySmarts – I understand the reservation but in the end the container ends up just being the outer fascia. Inside is very traditional and comfortable. @Little House – FWIW… If I could do it again (and convince the wife!) 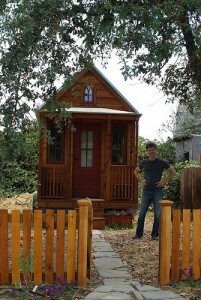 I would buy as small and inexpensive of a house as we could possibly find. The quicker you can build wealth the sooner you can afford whatever you really want. @FinEngr – Change is always difficult, especially if family is involved. @MoneyReasons – I considered that myself. You might not think so but I think it could be done. There is precedence, Hechinger hardware stores was started by a family that would tear down old barns, prep then sell the used lumber. @Roshawn – I’m with you on that, but let’s challenge ourselves to find housing that represents the smallest possible portion of our net worth. @SIF – Not only that, but if your are willing to go small and more importantly, simple you can have decent home constructed. @finallygettingtoeven – poke around the PF blog world and you will see some pretty convincing articles that side on renting over ownership. It just might work out best. Then again if you are going to travel, maybe no home is best. Just sign up for house sitting gigs! @Squirrelers – The agents in our area were trying to convince us to buy nearly twice the house. I have often considered how unhappy I would be right now had I listened! Home equity is a bit of a misnomer. A large home equity can even mean a large negative cash flow, which is detrimental to financial freedom. In general though, for me, location-location-location holds. I’d rather live in a small place in a great location than a great place in the boring location. I don’t know it for sure, but I also suspect that being tied to one location for decades might not be the optimal solution for me. For the past 15 years, I have moved every 3 years or so; about 1500 miles at a time. .-= Early Retirement Extreme´s last blog ..The Latte-factor and brewing your own coffee =-. Finally, I located the information I was searching for. I have been doing research on this subject, and for two days I keep finding websites that are supposed to have what I’m looking for, only to be disappointed with the lack of what I needed. I wish I would have found your website sooner! I had about 40% of what I was looking for and your web-site has that, and the rest of what I had to have to finish my research. Thank you and keep up the good work!